Run! Alien Invasions, we come in peace,leaving you in pieces! I watched alien comedy Paul (2011) recently which got me thinking about E.T (1982), where my dad would make me wear his Parker, hold a torch and say “phone home” – those warm a fuzzy days eh. It got me thinking about alien films in general. There’s been some turkeys recently The Fourth Kind, The Day the Earth Stood Still (2008) to name just two. I’m a sucker for alien invasion films, call me a geek (but it’s hardly surprising coming from the guy who still recall the lyrics to the 60’s Iron-Man and Captain America cartoon theme tunes,the re-runs). I must say I wasn’t a fan of Independence Day (1996) or Men In Black (1997) maybe it’s that watered down/appease the masses/play it safe middle of the road stuff that entertains but doesn’t excite or entice. Whereas Tim Burton’s Mars Attacks (1996) was all out dark comedy and Invasion of the Body Snatchers tackles the subject ominously sober for me it’s those films that are just more appealing. Check out the Cellulord’s blog where he wonderfully breaks those Invaders down into five sub-genres. Here’ a few thoughts on those mass invasion stories that you may have missed or simply avoided from various reasons. A platoon of U.S. Marines during a global alien invasion try to stay alive and take hold of Los Angeles while extracting a group of innocent civilians. Battle: Los Angeles shares of much of the look and relentless extraterrestrial attack of Skyline (2010). However, where Skyline portrayed it from civilian point to view this is very much a story from the perspective of the Armed Forces. Chris Bertolini’s screen-play pushes heroism and all its clichés to the limit, at times the film plays as a training or recruitment U.S. Marines video with each character needing to plug the name of every type of weapon used. Although there is a consistent overuse of a shaky handy-cam effect a credit should to go to director Jonathan Liebesman as the set ups are well covered with a feeling of geography so you never feel lost in the quick pans or sharp movements. It’s a serious stab at the subject matter and the effects are outstanding, mirroring the realism of Monsters (2010) and District 9 (2009) to name a few. Both Ramón Rodríguez and Michelle Rodriguez are notable but it is Aaron Eckhart as a veteran SSgt. Michael Nantz who carries the most credence. Reminiscent of Cloverfield (2008), Black Hawk Down (2001) and Saving Private Ryan (1998) – if there’s room for another alien invasion with a war element flick this will appease but if you feel you’ve seen it all before it’s probably because you have. Overall, formulaic but still mildly entertaining. Before Alien Nation, before Independence Day, there was V. A race of human looking extraterrestrials arrive on earth. These ‘vistors’ led by alien Anna come in peace, however, behind her smile is a sinister plan to take over the world. The latest ‘reimagining’ of V is a competent rework of the original 80’s TV show. Despite some ropey CGI effects, the story, characters and script carry some weight, there are shades of grey, not everything is black and white… Unorthodox alliances, double crossings, morale choices and sacrifice are just some of the themes amongst a cloak and dagger alien invasion. There is action, drama and of course it’s played possibly as realistic as you can get considering it a show about lizard aliens. Jane Badler the original female protagonist appears in season 2 as ‘Diana’ which is a nice nod for fans of the predecessor albeit as a different character with the same name. And also Marc Singer gives a cameo. Notable are actors Scott Wolf and Laura Vandervoort. Worth mentioning is Anna’s right hand man played by Morena Baccarin and tough guy Kyle Hobbes played by Charles Mesure. Evil executives at ABC have cancelled the series after season/series 2 which is a crying shame as there were plenty of places V could have been taken with the right story writers and good characters already established such as FBI agent Erica Evans, played by Elizabeth Mitchell and Joel Gretsch as Father Jack Landry. It’s said that it ends on a cliff hanger but that depends on who’s side your on, there is one winner, if no more are made… Worth seeing, I’ll now finish this sentence as abruptly as ABC’s cancellation. 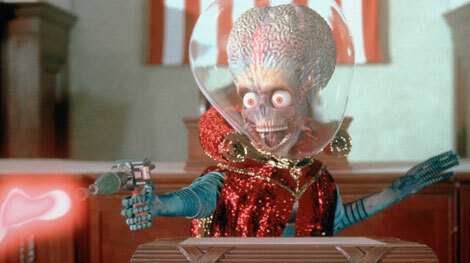 For six years large aliens have been on earth and inhabit the ‘infected zone’ between the US and Mexico border. After a monster destroys a hotel the daughter of an executive is injured and under instruction from his boss a photographer must ensure she gets back to the US. However, after a series of events it becomes more difficult than expected and they both must journey through the infected zone. Début leads Whitney Able and Scoot McNairy are impeccably first-rate and would put any A-lister to shame. Any lesser casting could have ruined the film but the realistic portrayal they deliver, packed with emotion is easy to relate to, it’s surprising how they command the screen and keep you enthralled. The rest of the uncredited cast are exceptional and everything is played for realism. Note worthy is the ticket selling desk clerk. The dreamlike score is fantastic, Jon Hopkins’ beats and hums capture and heighten the moments – it’s very memorable, reminiscent of John Murphy’s 28 weeks later subtler moments. Credit must go to director/writer Gareth Edwards for the fantastic subtle script, great locations and fantastically executed effects. Whether intentional or not there’s plenty of social commentary, political values and society reflective parallels going on but those aside Monsters is a journey of two people finding themselves. At first I was expecting another War of the Worlds rehash, District 9, a grounded version of ID4, or even a better version of Skyline but what I got was a journey story with aliens as the back drop. If only Jurassic Park could have been filmed in this style. Monsters took me by surprise, I didn’t expect it to be such a wonderful film. Gareth Edwards is certainly a multi-talented individual and not one to watch – as he’s already there. Immersible cinema. Stop me if you heard this before. Aliens invade earth and a handful of survivors try to escape their impending deaths. It’s another War of the Worlds-esque invasion flick and what’s nice about this is that it’s played straight with no comedic one-liners and there’s not a teenager in sight. Directors Colin Strause and Greg Strause are no strangers to special effects after bringing to life the Predators and Aliens in AVPR (2007) and the rest of the team behind Skyline’s extraterrestrials are clearly talented making the best out of a budget. It’s visually wonderful, the special effects are fantastic. Nevertheless, Aliens (1986) designers and suit wearers Alec Gillis and Tom Woodruff Jr. creature designs appear to be an unoriginal mix of The Fly, Independence Day, Cloverfield and The Matrix. The acting is above average and the leads including Eric Balour and Brittany Daniel carry the emotion well. David Zayas is notable but his screen time is limited. That said, the script lacks enough meaty dialogue to keep you enthralled and you find yourself waiting for more glimpses and shenanigans of the alien invaders. Overall, it looks great but it fails to connect and grip you. The Brothers Strause will hit gold but Skyline just isn’t it. Humanlike, skeleton looking, extraterrestrial’s have taken over the Earth and walk among us, but are cloaked by a transmitter that makes ‘them’ appear like us. A drifter discovers a pair of sunglasses that allows him to see what is being hidden. Halloween’s (1978) horror legend writer/director John Carpenter does his best with a limited budget. The film for the most part has an urban realistic look, due to the on location shots, however, at times it appears very cheap and lacks the production values of The Thing (1982) or The Fog (1980). In true Carpenter tradition there’s a heart pumping and relentless score. Amongst all the 80’s cheese there is a fantastic story based on Ray Nelson’s short story. They Live themes reflects consumerism, class and corruption to name a few. Underneath, Carpenter’s bland screenplay lay a fear that we are not in control and our society is led by ‘them’, echoing Invasion of the Body Snatchers and ‘V’. To join them would be to give I and we would benefit but we’ll pay a greater price. They Live is high concept sci-fi with great ideas, the sunglasses touch is genius, that’s original and allows some great visuals and interesting moments. There’s also the intriguing secret society aspect and space travel. Suffering from the 80’s macho testerone Roddy Piper is entertaining as the lead but he’s no great actor, lucky there’s the likes of Meg Foster and Keith David to gives the film some weight and there are some good performances from the supporting cast. Carpenter though a simple story immerses the viewer in the conspiracy and connects us with the heroes search for the truth which has a fantastic, un-Hollywood brave and downbeat ending. In addition, the effects are of the time but are still effective, there are some stand out set-ups, the supermarket, the underground segment and the discovery of the sunglasses. I’m hesitant to use the word, but They Live is cool. With so many remakes in recent years They Live would benefit from a serious and heavier version. That said, taken at face value it’s a great fun ride, with one-liners, action and aliens. An alien lifeform crashes to Earth, spreading tainted debris this in turn infects people bringing them under the invaders control. Remake of remakes and based on Jack Finney novel, thankfully The Invasion borrows more from Invasion of the Body Snatchers (1978) and as a plus doesn’t try to recreate its daring chilling ending, coming up with its own penultimate finish. The supporting cast are great and include ’78’s Veronica Cartwright. It is a fine cast ensemble that reunites Jeffrey Wright and Daniel Craig in two effective roles as they help Carol Bennell played by Nicole Kidman find her son and stop a virus that is turning humans into ‘perfect’ emotionless shells of themselves. Kidman’s endless supply of unnecessary fitted clothing and botox aside, she gives a good performance and despite some surprisingly already dated effects shots of microscopic virus the film is well crafted. Overall, if not compared to its predecessors, The Invasion ticks all the boxes as a retelling of a character driven, sharp, thrilling sci-fi. After being freed from its ancient crash site an extraterrestrial life form infiltrates an Antarctic research station, imitating taking the appearance of the researchers that it kills. An atmospheric understated sci-fi at it best. I’ll never understand how Carpenter lost the lustre in some of the other film he made, nevertheless, his Thing is one of his best movies and also once of the best sci-fi movies ever. Despite being based on the same source material (before remakes were popular) the thing has a look and feel of it’s own and is very different from its 50’s counterpart. The isolated setting, the astounding cinematography and scenery creates intrigue; drawing you in from the very beginning. It’s a perfect horror/sci-fi cocktail of Ennio Morricone’s haunting foreboding score, Rob Bottin and Stan Winston’s benchmark practical effects (which are to-date arguably unsurpassed) Carpenters claustrophobic set ups and Bill Lancaster screenplay. It’s rare that every single actor is exceptional and supplied with effective dialogue. All the cast from Kurt Russell to Wilford Brimley as Blair are all captivating, great casting by Anita Dann. The characters have their own issues and as the paranoia sets in relationships are forged and other broken, building to a bold and satisfying conclusion. This is more than just a cult film with a ‘monster’ hiding in warm places surrounded by snow, it’s a finely tuned science fiction horror masterpiece.